Charming Folk Art Mirror, the dark green rectangular frame surmounted by a painted urn filled with spring flowers and fringed draperies extending from the urn. Circa 1880. American Wrought Iron Dictionary or Music Stand, with three scrolling legs supporting a twist turned pillar and an angled book rest. Early 20th C.
Pair of antique clear molded glass four light candelabra with hexagonal base, faceted pillar, three scrolling arms and bobeches hung with cut crystal lozenges and elongated faceted drop prisms. Circa 1900. 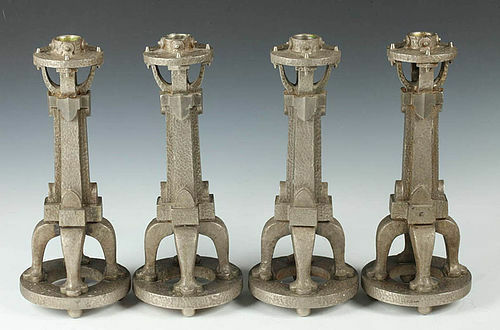 Set of Four Hammered and Silvered Bronze Arts and Crafts Candlesticks, Early 20th Century, Unmarked. 13" high. Brass two-tiered, twelve light chandelier with turned baluster supporting two tiers, each with six scrolling candle arms. 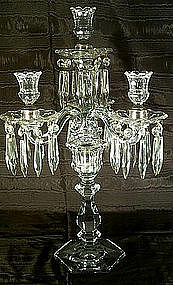 The large ball below the juncture of the arms and the drop ring are typical features of 18th century Dutch chandeliers. Early 20th century. Now electrified, polished and lacquered. This item has been sold. It remains on our website for internet research purposes. Because we sell to many other dealers, we cannot disclose the sales price. Height: 10" Max. Width: 7"
Striking Art Noveau Terra-cotta Pottery Pedestal by Bretby Art Pottery, England, having a circular top with floral relief border above a stylized pillar with tendrils and flowers and a conical base with faux cabochon mounts. (Top and base extensively repaired). Antique Jewelry Box in mahogany; of scalloped form with geometric banding on body and marquetry roses on lid. Circa 1900. Chinese porcelain tall jar with lid with prunus blossoms on branches against a blue background, a single pheasant on a branch. early 20th Century. Now drilled and wired as a lamp. Antique Chinese bottle form sang-de-boeuf vase, Guangxu-Xuantong Period (1875-1911), now mounted as a lamp. Antique Biedermeier Miniature Chest of Drawers, in satinwood with ebonized moldings and pulls; having a overhanging top drawer above three graduated drawers and raised on turned toupie feet. Although often called salesman's samples, miniature pieces of furniture like this were probably the work of an apprentice cabinetmaker to show the master craftsman his ability. Exceptional Pair of Bronze Dore Figural-form Candlesticks, having removable drip pans, pillars decorated with swags and three busts and circular plinth bases. French, circa 1870. Unusual Antique Green Marble Pedestal, in the form of two columns with a rectangular stepped plinth base and a rotating top for viewing sculpture. The form is reminiscent of Grand Tour memorabilia. Very Rare Antique Venetian Gondola Chair, in walnut with gilt cast iron dolphin form base, caned seat and back and carved armrests. Italian, late 18th / early 19th Century.